Do You Like Your Collard Greens Hot and Spicy? If you don’t like the heat of chili peppers or the tang of vinegar, then this recipe is not for you. On the other hand, if you like lots of heat, blended with a little bit of tang found in vinegar or pickled peppers, then you will enjoy this recipe for Tangy Hot and Spicy Collard Greens. Don’t expect this tangy hot and spicy collard greens recipe to taste like traditional collard greens recipes. 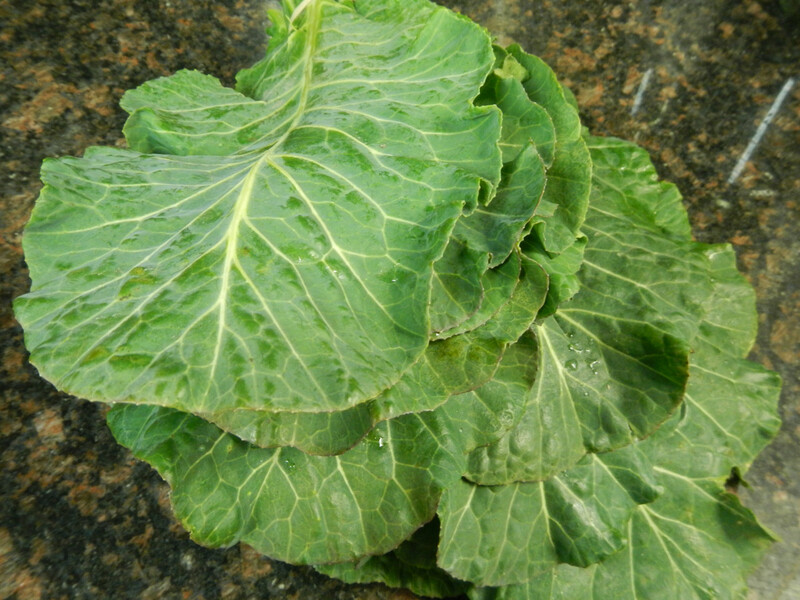 If you want traditional collard greens, like your mother would have made, try my other collard greens recipe: Cook Fresh Collard Greens for a Flavorful Dish. While coming up with this recipe, I tried various ingredients. The ingredients in this recipe are the ones I have found to deliver the tang I was seeking, along with a little bit of heat from the peppers. To add tanginess, I opted for vinegar and the juice of deli peppers. Cook bacon in a large pot. Place the diced bacon into a cold pot. Turn the heat to medium under the pot and cook the bacon until it is crisp. Do not drain the bacon grease. Add onions, garlic, salt, black pepper, and sugar to the bacon grease and stir until the onions are caramelized. This should take no more than five minutes. Add the collard greens. Stir to mix. Make sure you get the bacon grease and other ingredients to touch all of the leaves. The greens will wilt a little, but that's alright. That's exactly what you want them to do. Add the water, peperoncini, peperoncini juice, vinegar, chili sauce, and hot sauce. And then stir everything together. 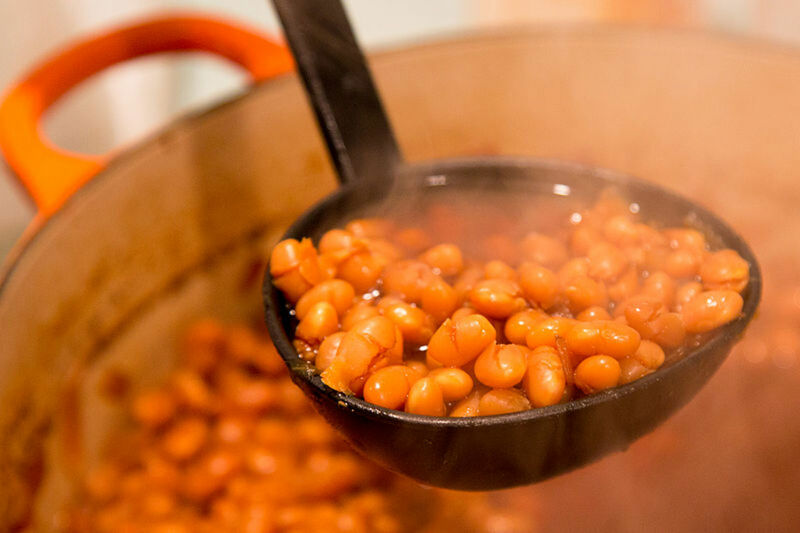 Bring everything to a boil; reduce the temperature to simmer. Cook for about 20 minutes. Depending on the texture you like for your collard greens and the temperament of your stove, it could take a few more minutes. Some people like their collard greens to be really soft and limp. I like my collard greens to have more "chew". 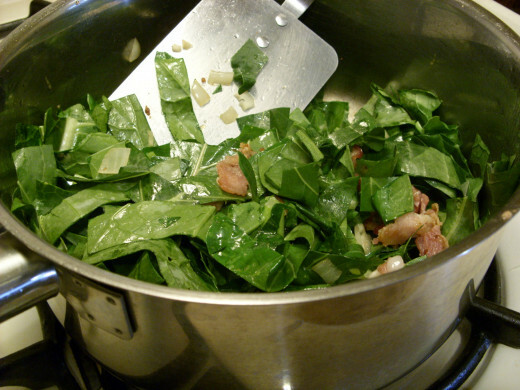 If you like limp collard greens then you will want to cook them for 30 to 45 minutes. Enjoy collard greens as a full dish with a slice of freshly baked corn bread or serve collard greens as a side dish, accompanying a main meal. 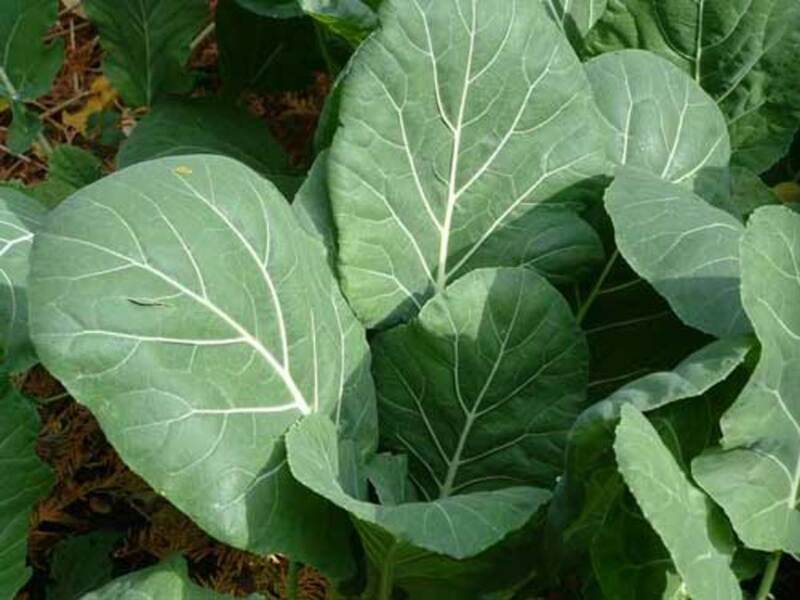 I grow several collard green plants in my yard, and I use a technique called sustainable or continuous gardening to harvest my collard greens in a way that allows me to keep the plant growing and producing. This unique way of harvesting collard greens keeps the plant alive and producing for an extended period of time. To harvest on a continuous basis, all I do is cut a few leaves off of each plant - only cutting what I need for the intended meal. When I cut off leaves, the stalk continues to sprout and the leaves left on the plant continue to grow. Oh, for sure, Marsha Musselman1. This isn't for everyone. Some may like it hot, but not so spicy. I cook my regular collard greens for company, but I cook 'em hot and spicy for my husband and me. Yeah, isn't that interesting that nutritionists are now recommending that some green leafy veggies be cooked for added value. I can't keep up! i don't think this is the type of heat that I'd enjoy, but this gives me ideas for coming up with something that I would like, hopefully. Our family should be eating more green, leafy vegetables and I found out recently from my sister that they are better for us when cooked, (yuck). I'll have to try the vinegar approach, and maybe a related spice. I do like some of them, but not the ones you've used, so back to the drawing board for me. Hi DeBorrah K. Ogans. Thank you for your positive feedback. It is quick and easy. That's my style of meal. Quick. Easy. Done! MarleneB Nice quick tasty alternative. Must try! Thank You for sharing, Peace & Blessings! Hello catmalone. You are right. The spices in this recipe all come together quite well for heat, flavor, and tanginess that I like to taste in greens. I was looking for a new way to prepare my collard greens. I think spicing them up is little step up that will inhance all the other ingredients. Thanks! Hi Rajan. 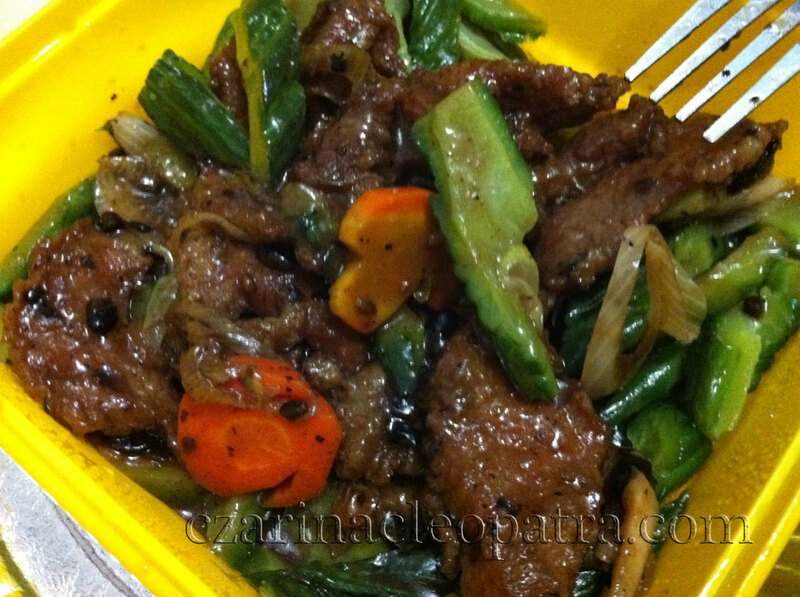 This is my tangy, hot, and spicy version. And, to tell you the truth, it is just as tasty without the bacon. Thank you for your feedback. Interesting recipe. We do make some leafy vegetables but in a different way and minus the bacon. Voted up, interesting and shared. Rated 5 stars. Hi DDE. I have never tried eating collard greens with potatoes and fried chicken. It sounds delicious. In fact, the next time I make collard greens, I will add your suggestions. I'm looking forward to it. Incredible Collard Greens we grow collards in Croatia and have lots of it in our Mediterranean diet and also boil with potatoes and is eaten with fried fish crispy fish your recipe looks delicious and I am familiar with that way of cooking a great meal indeed. Hello ChitrangadaSharan! I'm glad you like the recipe. I eat a lot of greens, too. I have not heard of Arvi. I'm sure it is as delicious as any other green. Do you know if Arvi can be found in the U.S.? If so, I'll look for it to try. Sounds delicious and simple to make. We have something similar to these leaves, called Arvi. 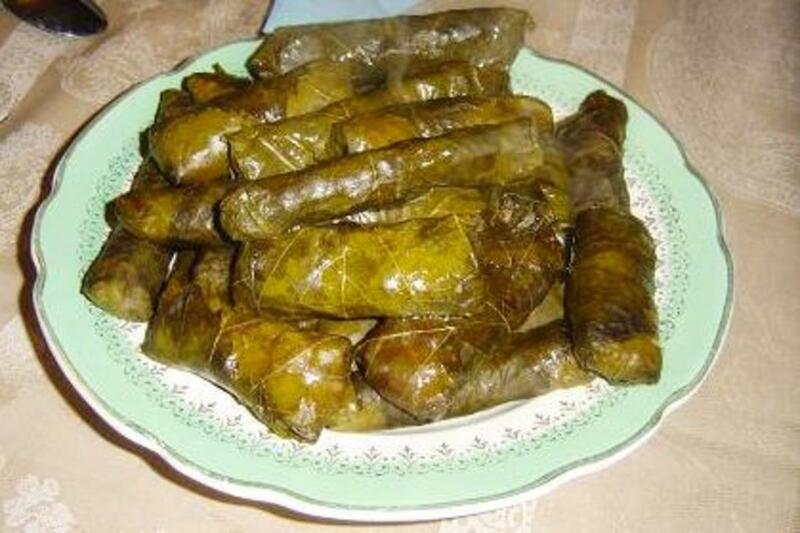 I love greens in any form. Thanks for sharing! Hello Victoria! I'm glad you like the recipe. Thank you for pinning it. If you like hot and spicy, then this will surely satisfy. Warning! It's hot and spicy... really hot and spicy, but that's the point. I hope you enjoy it. I love any kind of greens, and this recipe looks amazing. Pinning and trying it! Hello Careermommy. I like turkey bacon. I think it should work just as well. 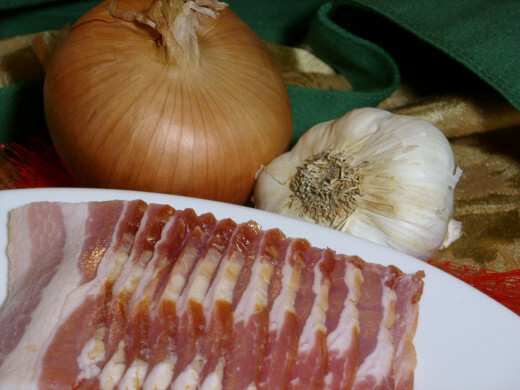 You might have to adjust (add more) salt for flavor because the turkey bacon is less salty than the pork bacon. Hello point2make, I hope you like it. Remember, it's definitely tangy, hot, and spicy! Hi Brett, I know what you mean about Thai food. One day when I was feeling sick, my husband forced (yes forced) me to go to a Thai restaurant. He said the food would make me feel better. Well, he was right. It is the way they use spices and peppers that makes a difference. Ever since that day (at least two decades) I have been experimenting with spices and peppers in regular recipes. These collard greens don't taste like traditional collard greens, but this dish is definitely tangy, hot, and spicy. I hope you have a chance to try it. Well, that looks like a tasty bowl of collard greens, MarleneB. Since we don't eat red meat I would substitute with turkey bacon. Hopefully, it'll have the same or similar effect. This is a recipe I'd like to try for my hubby's family. Thank you for sharing it. Looks and sounds like a great recipe.....especially the hot and spicy. Thanks for the "new" idea...I'll give it a try. Loved your hub. You had me at Tangy, Hot and Spicy!! lol I really like sour and spicy soups ... something I got into from living in Thailand for years, as they have a flair for using chilly in almost EVERY dish lol. Hi MsDora. The bacon provides a little meat, but it's mostly for adding flavor and texture. To make it more hearty, by all means this recipe could use a little meat of any kind (preferably pork). If I were adding meat, I would chop the meat into bite sized pieces, sear, and then add it in. It's worth a try! Wow! This looks good, but I'm not sure how it will taste without the meat. I'll still like to try it for the tangy taste and the heat. Thanks for creating and sharing. Thanks so much, Om Paramapoonya. I am flattered. Thank you for sharing this recipe. It means a lot. Hi BlossomSB. I don't think there is another common name for them. 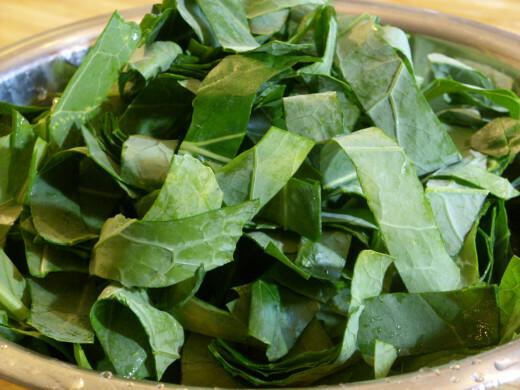 Other countries call collard greens by their native name, but in the U.S. I think that's the only name they are known by. 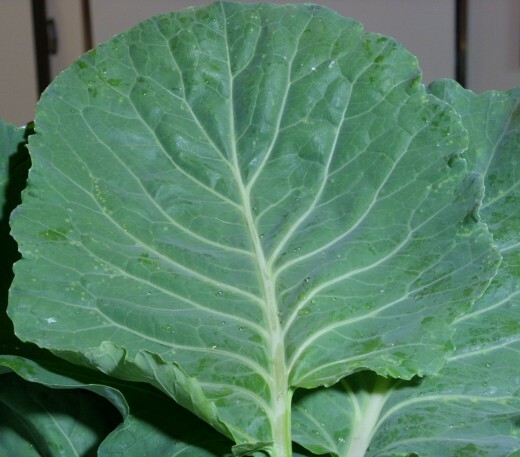 Collards are in the same family as cabbage, which is probably why it appears familiar. Hi alocsin. 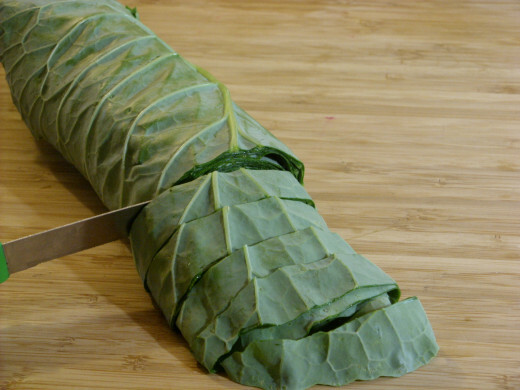 Like you said, this is just another way to prepare the collard greens. Be prepared - this dish is not going to taste like your typical collard greens dish. My partner really loves collard greens, although I'm not a big fan. I'll forward him this hub because it gives him another option for preparation. Voting this Up and Useful. Thanks for the recipe. I'm afraid I don't even know what Collard Greens are. From the photo it looks like cabbage. Do they have another name as well? Hi tamron! 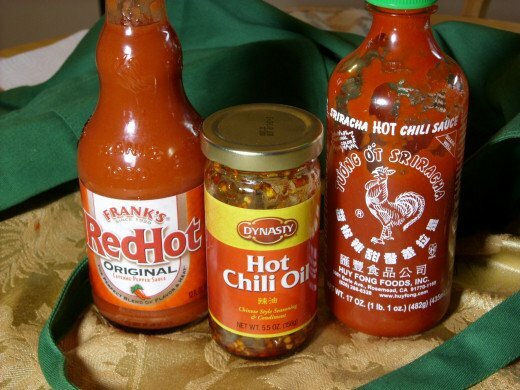 Good, because if you like it hot and spicy, then this recipe certainly satisfies that criteria. I will have to try this recipe. I love Hot and Spicy Collard Greens. I love any kind of greens but Hot and Spicy Collard Greens are my favorite. 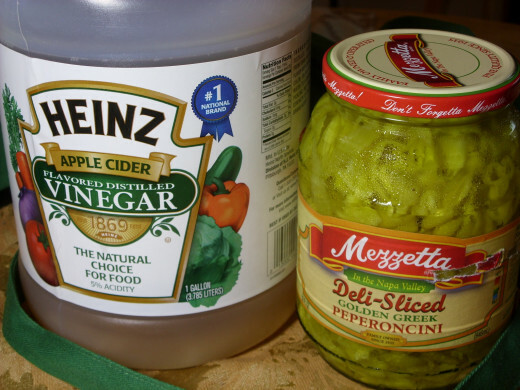 beingwell - I agree with you about the vinegar. 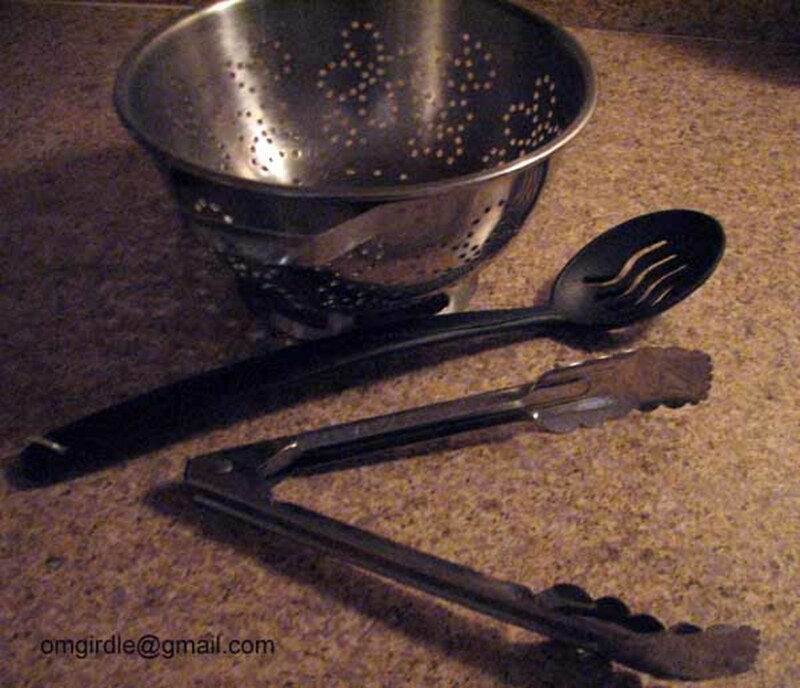 I use to do the same thing, but now, since I'm the cook, I just put it right in the mix while I'm cooking the greens. Mhatter99 - I can't say I'm a collard greens master like your friend, but I do like collard greens and enjoy thinking of different ways to eat them. CozyPozy - Thank you for the compliment. Once, I saw a guy holding up a collard green leaf that was about 10" wide. I was so impressed I wanted to try to grow mine that large. He said the trick is to give them lots of space and they will grow larger because they are less inhibited. I like greens with a little spice and always add a drizzle of vinegar to them at the table. Can't wait to try you recipe! Thanks! Thank you for this. I had a friend who was a collard greens master. Oh-lala!! I like it! Those collards are pretty huge. You're quite a gardener! Voted up and shared. Hi Faith, you are right about one thing - this one will really spice things up a bit. Definitely not bland. Thank you for reading and for your comment. 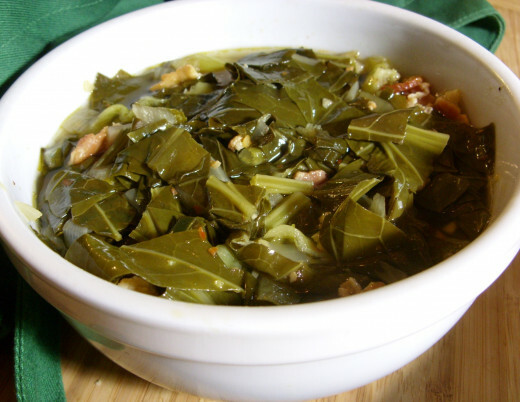 Whoa, I have been looking for a great twist on collard greens and recipe ad here it is!!! I wish I had this onc at Easter, it would have spiced things up a bit! You are quite right in your assumption, Bill. In fact, in order to grow collard greens well, you have to live in an area that delivers the same, southern conditions. I happen to love collard greens, so the Lord blessed me with ONE spot in my garden (and I do mean ONE SPOT) where the collard greens grow well. I have only been able to find collard greens in stores that cater to (clearing throat) less fortunate neighborhoods. Since I am scared to go to some areas just for collard greens, I started growing my own. 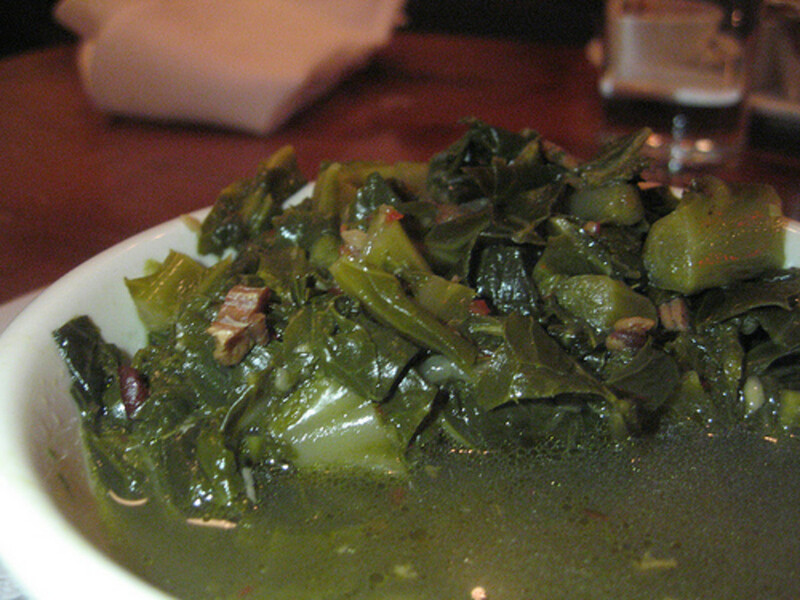 By the way, if you try them, try my recipe for regular collard greens. This recipe is a bit radical with the hot and spicy angle. Even my mom thought it was a little bit "different". But, she still asked for the recipe. She wants to venture out for a new flavor, so I'm sending it to her. Serious question: are collard greens a Southern food staple. I swear I have never known anyone in the Pacific Northwest who ate them, but I hear about them all the time from people I know in the Deep South. I don't even remember seeing them in the produce section of the stores. Anyway, if you suggest them then I'll have to try it. Thanks for the recipe.